Exfoliating, lathering pouch. Each bag contains the equivalent of over 2 bars. Designed to buff and remove dead skin cells and increase circulation leaving the skin renewed, fresh and alive. 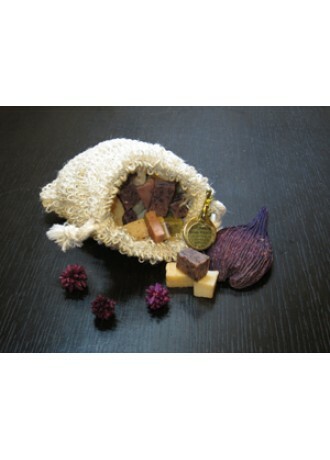 Pouch contains an eclectic medley of different soap strips and pieces, so no 2 pouches smell the same. The soaps consist of a moisturizing base of olive, coconut, sunflower, cocoa butter and shea butter, so lather and moisturize beautifully. 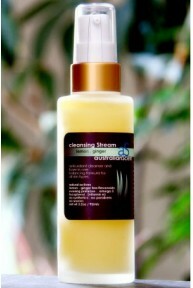 For use in the shower or bath and like all great recyclable products - refillable. For use in the shower or bath. Saturate product thoroughly with water. Leave soap in bag. Wash and exfoliate body using entire bag. Squeeze out excess water between use and allow to dry. Bag may be refilled with additional soap when empty.